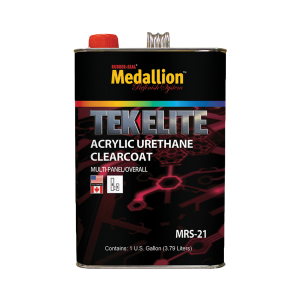 MRS-21 TEK ELITE Clearcoat is a 2.1 V.O.C. clearcoat formulated to be used in the most stringent V.O.C. areas. This acrylic urethane clearcoat is a multi-panel/overcoat clearcoat. It can be used as an air dry or bake system clearcoat. MRS-21 TEK ELITE Clearcoat mixes at a 4 to 1 mix ratio with a temperature control activator system MRS-60 Fast, MRS-75 Medium or MRS-90 Slow. MRS-21 TEK ELITE Clearcoat is available in gallons and quarts.